While the many benefits of cement have made it a huge global business, it remains a difficult material to handle, in terms of both its potential to pollute the environment and being a very bulky material to transport, says Paul van de Vyver, General Manager of DemcoTECH Engineering. “This is why,” notes van de Vyver,“we see cement producers choosing to locate their plants close to the source of their vital raw material and to their customers, and seeking out engineering houses with specialist expertise in efficient and environmentally friendly technologies suited to the specific needs of the industry. 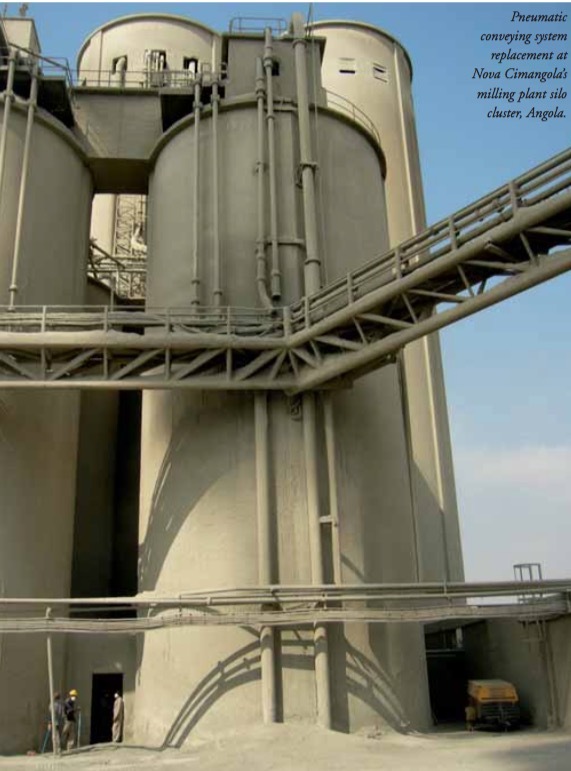 “As a leader in the bulk materials handling field, we work with other leading consultants in the cement industry to offer a range of services from conveyor design to the design and construction of cement and clinker silos, controlled extraction and transport systems, offloading of road tankers and complete ash handling plants. For example, at NPC Cimpor’s Simuma Plant, DemcoTECH, working in joint venture with Kantey & Templer Engineers of South Africa, designed and installed the new clinker silo with associated materials handling plant. This facility is located alongside its raw material source, limestone, in the Oribi Gorge area of South Africa’s KwaZulu-Natal province. “Environmental considerations were therefore of paramount importance in designing the silo for Simuma so as not to impact negatively on this very scenic and eco-sensitive part of KwaZulu-Natal,” says van de Vyver. Other challenges included the need to complete this fast track turnkey project within 15 months as well as to design a materials handling system that can handle clinker at temperatures over 200 oC, with the versatility to feed clinker to either the existing or the new silo Kantey & Templer was responsible for the civil and structural design, engineering and project execution of the 40,000-tonne multi-discharge clinker silo, while DemcoTECH supplied the materials handling expertise to the project — from the mechanical and electrical design, through to the engineering and project execution of the system. Positioned alongside the existing silo, the new silo consists of a 40,000-tonne free capacity, reinforced, prestressed structure with a 30m internal diameter and 55m height. The clinker silo has two reclaiming tunnels and a precast concrete conical roof. The silo is founded on a full raft foundation, 36m in diameter and 1.3m thick. This raft is in turn founded on an engineered fill layer, which extends 4m below the natural ground level. The silo receives clinker from the kiln at temperatures up to 205°C, via a silo feed Aumund steel pan conveyor. Two DemcoTECH-designed reclaim belts with heat resistant belting extract the clinker to feed the existing plant or rail loading system. The silo discharges at 250tph (tonnes per hour) onto each of the two reclaim conveyor belts. The new silo was part of an expansion drive by NPC-Cimpor, which included a new, second cement kiln, requiring an additional silo for storage of the increased clinker production. Johannesburg-based DemcoTECH Engineering is an acknowledged leader, both locally and internationally, in materials handling systems for the cement and other industries. The comprehensive suite includes specialized pneumatic, air-assisted, troughed AeroConveyorTM and pipe conveyor systems to provide totally enclosed, environmentally friendly handling. The DemcoTECH pipe conveyor technology, comprising both fabric and steel cord belting, and with up to 2,250tph conveying capacity, can be designed using a triangular tubular gantry fitted with a mobile maintenance trolley. The trolleys were manufactured and pre-tested in South Africa at a 16° inclination, before being containerized for transport to site. The trolleys are self-propelled by an on-board generator and include hydraulically driven travel mechanisms for a high level of control. The trolley designs include a number of safety features such as fully enclosed access facilities, emergency brake systems and heavy duty traction control. Working in conjunction with Claudius Peters in Germany, DemcoTECH also supplied a 150tph pneumatic transport system to convey cement from a kiln to multiple storage silos at the cement plant. Loaded, the pipe conveyors’ open belt is formed into a tubular shape as it passes through transition idlers, giving it its customary ‘pipe conveyor’ name. This ‘pipe’ shape is retained along the full length of the conveyor and enables the conveyor to be curved through vertical and horizontal curves that are far tighter than is possible with troughed conveyors, while at the same time retaining the high- capacity, long-distance conveying capability of troughed conveyors. At the terminal point the belt opens up for material to be discharged in the same way a troughed conveyor is discharged. On the return-side, the belt is also formed into a ‘pipe’ shape and can be used to transport material in the opposite direction, with significant cost advantages. With the exception of the specialized belt carcass design, DemcoTECH’s pipe conveyors, with diameters of up to 500mm, make use of readily-available conventional conveyor components. “We also engineer two-way pipe conveyors, multiple curve pipe conveyors and distributed drive pipe conveyors,” says van de Vyver.